Can the Democrats Green New Deal really work? 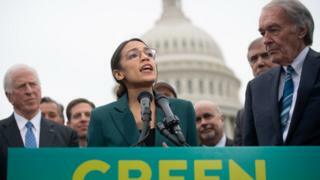 Despite being labelled as a “socialist manifesto”, the Green New Deal (GND) on climate change and jobs has sparked a lively debate in US politics. So what’s in the deal and what will be its likely impact? President Trump was quick to thrash the Democrats’ new approach to tackling rising temperatures. Republican leader in the US Senate, Mitch McConnell, said on Tuesday he will bring it to the Senate floor for a vote, so Democrats will have to back it or distance themselves from it.